After having known R for just a week, we already started planning our future move to China in 2014. So when Christmas 2013 came around, we decided to spend the big day just the two of us: we didn’t know when our next Christmas in the UK would come around and we were so loved up we wanted to spend a romantic, warm Christmas Day our way! As I live in a different city from the rest of my family, we arranged to visit them when public transport resumed on the 27th for a cheeseboard/buffet lunch. So on the 25th, after getting glammed up and getting the turkey in the oven, me and R headed out to see the city. 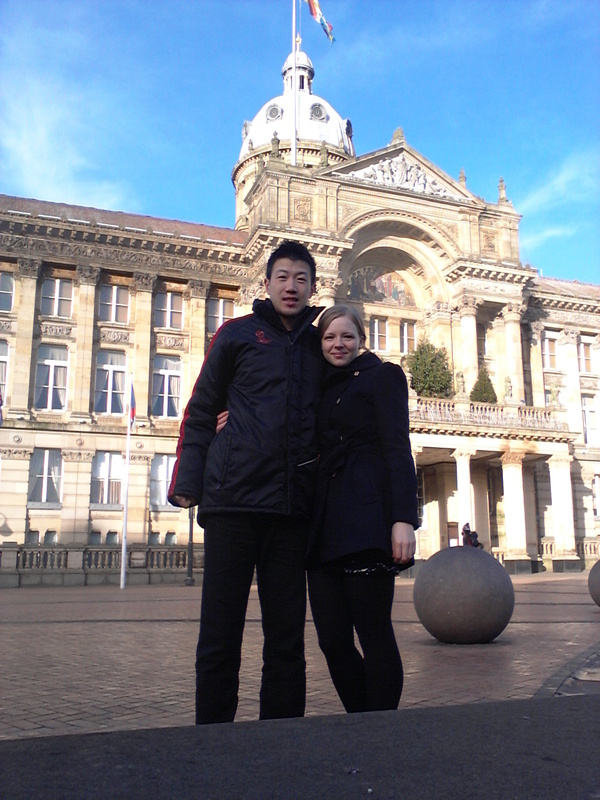 Birmingham is the UK’s second city and my flat was in the city centre. I absolutely loved my flat, I found it a very peaceful place, but as soon as you stepped out the building, it was always absolutely packed with shoppers. The most magical thing about Christmas Day in Birmingham city centre is it is the one day of the year when the people are gone! Just for one day, the shopping is done, the shops are closed and everyone is snuggled up in their suburbs. We perhaps saw 10-15 people with the same idea as us. The weather was beautiful too, a cold but bright day, not a cloud in the sky. After a good wander, we went back to devour our feast, sit by the Christmas tree and watch our favourites films. I may not have received any presents that day, but I have a very cherished memory. I won’t forget that day, it was wonderful. This Christmas Day will be somewhat different. It will be spent here in Guilin, probably quite chilly (outside and in), the Christmas tree will be significantly smaller, there won’t be turkey, but it will be spent with my new husband and 6 month baby bump and that’ll be just lovely. 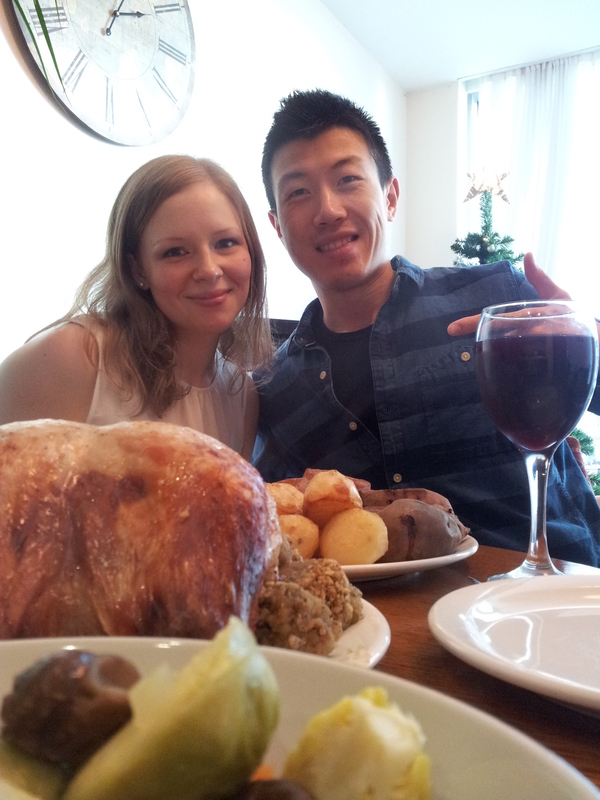 This entry was posted in Food, Love and tagged AMWF, Christmas. Bookmark the permalink. ← 100 days to go! Thanks Constance, Merry Christmas to you too!! Right now I can’t quite picture next Christmas 😛 I can’t wait! It’s hard to imagine, isn’t it? I felt the same way last year when I was pregnant and now my little guys is already 8 months old. Time will fly! Aww I hope the two of you have a wonderful time together 🙂 Merry Christmas! Just 12 short weeks, it’s not seeming so short! I was in Birmingham one day during the holiday season last year and remember thinking it was so crowded, just like Manchester this year. Christmas Day looks wonderfully peaceful in the city. Christmas with a 5.5 baby month for me! It’s a whole new and lovely experience. Last Christmas without a little one :). We should enjoy the last peaceful Christmas before we become Santa 😛 I hope you have a great one, Merry Christmas! Merry Christmas, Sarah! We are spending our first (and last) Christmas as an engagement couple, in lovely Central Ohio. Enjoy your time together! Merry Christmas, Mark and Kara, I hope you had a good one!